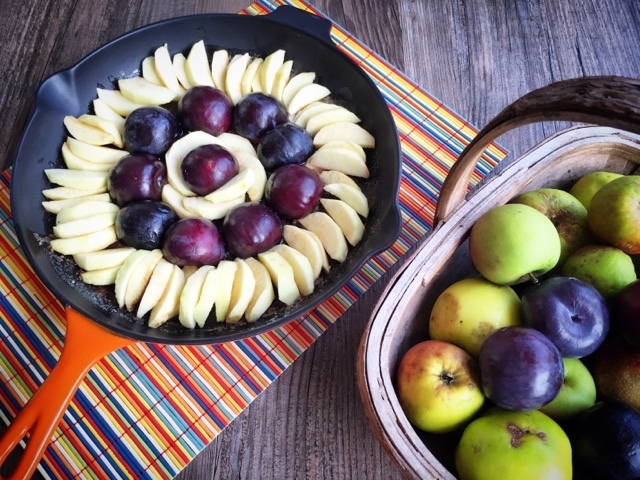 A delicious autumnal variation of the classic French Tart Tatin with Plums, Apples, Marzipan and Ground Almonds. Bon Appetit! Bonjour! Je m'appelle Foodie Quine. J'adore la nourriture. I'm afraid that's as far as my proficiency in French goes. It was never my strong point at school. I didn't even get as far as 'O' Grade. Nevertheless the folks at Expedia asked if I'd like to create a dish for their World On A Plate Challenge where this month the theme is France. I pondered over Moules, Frogs Legs, French Onion Soup, Boeuf bourguignon, Coq au Vin and Bouillabaisse but settled on an autumnal variation of a Tarte Tatin. 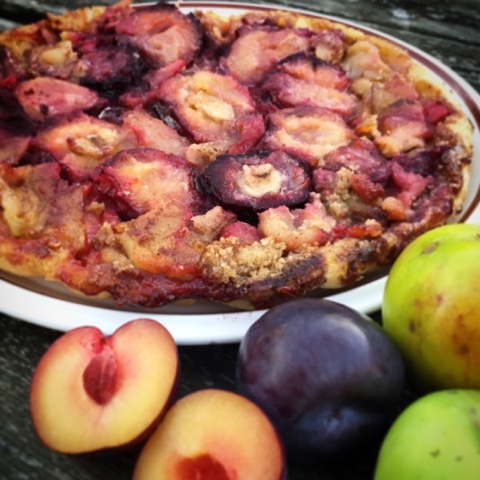 Elizabeth's Hungarian Plum Cake would also be a great way to use up a glut of autumnal plums. Before I put my apron on and headed to the kitchen I wanted to find out a bit more about the origins of the dish. The story goes that it was invented by mistake in 1898 by Stephanie Tatin at the Hotel Tatin in Lamotte-Beuvron south of Paris. She was in the process of making a traditional apple pie but accidentally left the apples caramelising in the sugar and butter for too long and they started to burn. In an attempt to rescue the dish she put the pastry base on top of the fruit and placed the whole pan in the oven. Et voilà. Tarte Tatin was born. I gave mine an autumnal twist on the traditional apple by adding plums, ginger and cinnamon plus marzipan and ground almonds. Its always rather a scary moment when attempting to turn it out. My apples had gone rather mushy. They were an unknown variety form my garden. Cox, Braeburn and Granny Smith give the best results according to Raymond Blanc. Bon chance! Melt the butter in a 28cm Tart Tatin tin or ovenproof frying pan on the hob. Add the caster sugar and spices and cook until the butter is melted. You don't need the sugar to dissolve at this point, plenty time for that in the oven. Turn off the heat and lay the majority of the apple slices in a circle around the outside of the tin. Cut the marzipan into 10 pieces and roll them into balls. Insert into the plum stone holes and place face down in the dish. Save the last plum for the centre and surround it with the remaining apple slices. Combine the ground almonds with the cinnamon and sprinkle over the top to fill in any gaps. Roll out the puff pastry so it is a couple of cm larger than your dish. Place over the top and tuck in the edges all the way round. Bake for 30-35 minutes until the pastry is golden brown and puffed up. Cool for ten minutes in the tin/frying pan before turn out onto a rimmed plate. Disclosure: This is a commissioned post for Expedia. As always, all views expressed are my own. I used to go to France lots as a child but haven't been for ages. Your tarte makes me want to go back there now! Despite taking French lessons for several years I can understand it more than I can speak it. 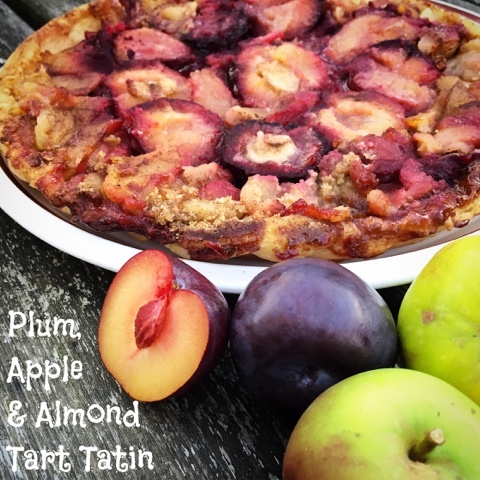 But I love tarte tatin and adding plums sounds like a brilliant idea. I have never made a tarte tatin before but really want to try... they are amazing. My french is about as good as yours, but I do so love to travel there. I didn't ever know the history of Tarte Tatin. 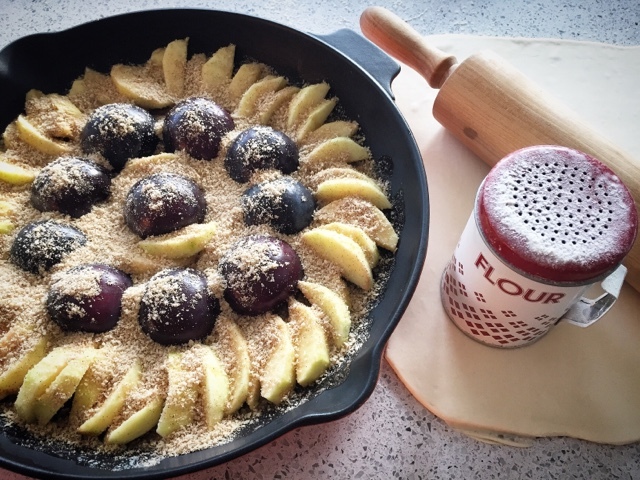 A brilliant accident I'd say - and I love the idea of using plums too! This looks gorgeous, perfect for an autumn dessert.